Just because you’re on the dole doesn’t mean you have to give up on all the trimmings at Christmas. 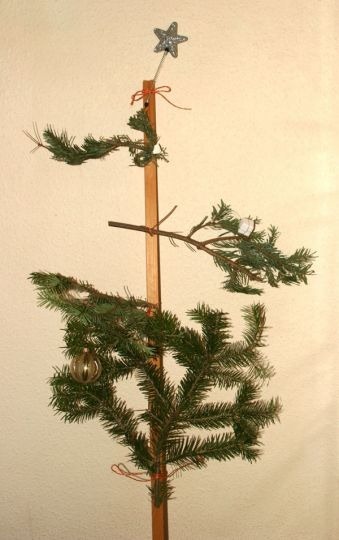 Realising that I don’t want to fork out over thirty quid for a Christmas tree, I decided to see what could be done with what I have. Here’s the impressive result. I thought I did quite well. Inspired by my own frugality, I’ve decided to drop the turkey this year too. We’re going to have stuffed pigeon, if I can catch one in the town. If not, then it’s gonna be a “road kill special roast” for Christmas dinner. I’ve sorted out the presents too. Looking round in the attic, I found stuff that we have long since forgotten that we own. My wife is getting some very stylish retro shoes and a couple of books. I found some very nice wine glasses too, so she may be getting those as well. I’m sure she’ll be pleased.